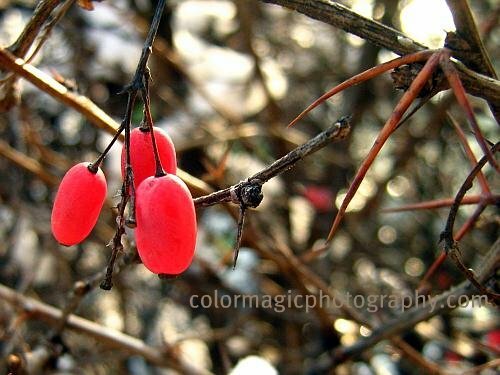 This winter I took many photos of red berries on bushes or in the snow. Here is another photo with bright red berries on a thorny bush. The large firm thorns didn't make the job very easy but there are no obstacles for a camera. Again, I don't know what they are but they bring color in long winter days. Brilliant and very poetic!Love the energy.. Vibrant and beautiful and natural. I don't know what they are either, but they have that same luminous transparency as yew berries. They look very lush in their stark surroundings. Beautiful! How cheerful, among all those thorns! Wow, those berries really pop. Wonder that the birds haven't found them yet. Ooo, that's a nice capture. I wish we had berries like that here; that would brighten up my snowy winter too! So cool. Thanks for sharing! they look luscious, and definitely eye-catching. Great photo. I like the contrast. Beautiful shot! I love the color. They look like they're lit from the inside. Isn't it amazing how the reds look even redder in winter?! Beautiful! It always amazes me when someone is able to find such beauty in everyday objects. I just don't have the eye for it. Fortunately there are those, like you, who do, and although I don't spot it, I can appreciate it when I see it. That's beautiful. Simple yet, gorgeous. Beautiful, what a vibrant shade of red. Those thorns are really sharp looking. Sure nice to see something so bright in the winter dull drums! Great find!